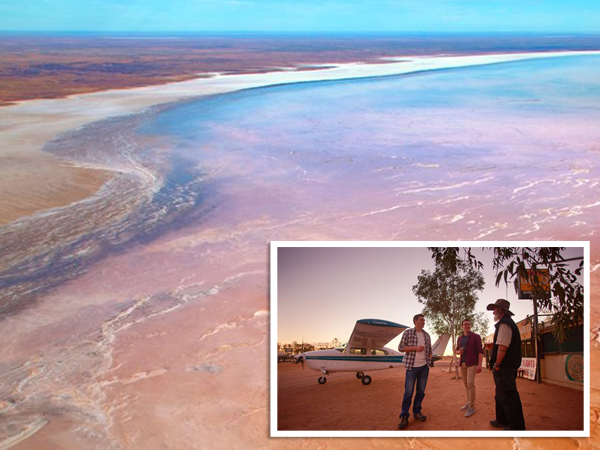 Don’t miss this perfect opportunity to thrill at the amazing & beautiful sight as Lake Eyre in the arid Australian inland comes alive with native birdlife & colours around a vast magical oasis! Fly from your homeport to the city of Adelaide, South Australia on the day before your tour begins. A transfer will take you to your hotel for your overnight stay. The rest of your day is at leisure for you to explore the city. There’s plenty to see and do in Adelaide – why not take a tour of the famous Adelaide Oval, a stroll down Rundle Mall or take a short tram ride to the seaside suburb of Glenelg. If you are arriving in Adelaide in the morning, you may also wish to take a half day tour to the McLaren Vale wine region or to the picturesque Adelaide Hills. Tonight, we recommend dining at one of the many restaurants in the city or in the seaside suburb of Glenelg. Adelaide travellers will be met at home and transferred to the Central Bus Station to join the tour. Interstate travellers will be picked up from the Mercure Grosvenor Hotel. This morning, we have an early start for our express journey to the opal mining town of Coober Pedy. We depart Adelaide at 6.45am on a climate controlled luxury touring coach with onboard toilet facilities. Travellers will be provided with a complimentary boxed breakfast onboard for the journey to Coober Pedy. During today’s trip, a refreshment stop is made at Port Augusta where you will be provided with a picnic style lunch before continuing north along the Stuart Highway to Glendambo Roadhouse for a short break. Arrive at the Coober Pedy at 5pm and check into your accommodation at the 4-star Desert Cave Hotel. After some time to settle into your suite, indulge in a delicious welcome dinner at the hotel restaurant. Coober Pedy, in the desert of the South Australian Outback has one of Australia’s hottest climates. To avoid the heat, much of the town has been built underground including houses, cafes & even churches! Its incredible lunar-like landscape has been the setting for many Australian movies including Mad Max, the Adventures of Priscilla – Queen of the Desert, Red Planet, The Osiris Child & Kangaroo Jack. This morning after breakfast, we begin our day when one of nature’s most wonderous events is revealed right before our very eyes! 2019 is a year in which waters from the Georgina, Umbum & Douglas Rivers descend the floodplains from North Queensland into Lake Eyre transforming the inland desert into an amazing oasis teeming with native birdlife & colour! Our flight departs Coober Pedy at 8am and tracks past the Coober Pedy Township and north east past the northern end of Lake Cadibarrawirracanna and on towards the Oodnadatta Track, Old Ghan railway line and Nilpinna Station. The old Ghan railway line operated up until 1980 and has some remarkable bridges and other history along its route. We fly abeam the homestead at Nilpinna, appreciating the remoteness of outback life, and on over the Davenport Ranges and Mt Margaret, which rise quite abruptly and impressively from the surrounding landscape. Once over the rounded hills and deep valleys of the Davenport Ranges we follow the descending floodplain on the eastern side of the ranges via the George, Umbum and Douglas rivers to the western shoreline of Lake Eyre. The stake beauty of the water flows across the terrain in the river beds is easily distinguishable from the air even when the rivers are not flowing, because the trees in the creek beds show up as dark green paths across the red/brown landscape. Entering Lake Eyre near the Umbum and Douglas river mouths, you will see the wide expanse of salt on the lake bed, with the effect of wind drift creating remarkable patterns and depending on the light, an array of earthy colours. Your flight continues to the centre of the Lake and the Warburton Groove, Hughes Island and Dulhunty Island where pelicans, ducks, bandied stilts, kites, small cormorants and sea gulls gather when the water is flowing. Our track now turns west, and clearly visible to the south is the mouth of Jackboot bay, Babbage Peninsula, Silcrete Island and Belt Bay. Silcrete is another excellent photo opportunity so get your cameras ready! From here, crossing into Belt Bay we see the deepest part of the lake at 15m below sea level. Then we pass by the ABC viewing station and the end of the Halligan Bay Rd and head west to William Creek on the Oodnadatta Track for lunch at the iconic William Creek Hotel. Departing William Creek, we head west briefly to pass above the Anna Creek station Homestead, then south to the Painted Hills, where you will be treated to a stunning array of colours and patterns in the pristine landscape caused by natural erosion in the area. Toward the southern end of the Anna Creek Painted Hills area, which is protected and located on the Anna Creek Station pastoral lease, we cross the Dog Fence and head north westerly back over some local mining tenements to Coober Pedy Township and Coober Pedy Airport. The flight includes full commentary via headsets worn by all passengers and superb window views. On our return to our hotel, there will be time for those who wish to enjoy any optional activities. You may wish to enjoy a short town tour or discover the unique opal mine & museum. Visits to a local underground house or church are also available. Check with your consultant at the time of booking for more details. Tonight, a sizzling barbeque dinner will be provided by our hosts at the Desert Cave Hotel. After a fully cooked breakfast today, we board our coach for our express journey back to Adelaide. We depart at 7.45am and travel south along the Stuart Highway to Glendambo for a short refreshment stop. Later, a lunch stop (own expense) will be made at Port Augusta before we arrive back in Adelaide at 5.30pm. Adelaide travellers will be met on arrival at the Adelaide Central Bus Station and transferred home by chauffeured vehicle. Interstate travellers will be dropped off at the Mercure Grosvenor Hotel. You will be dropped off at your hotel in Adelaide at the end of your tour for your overnight stay. The next day, enjoy a full day at leisure to explore Adelaide and South Australia. Ask us about optional tours that are available today including day tours to the Barossa Valley, Adelaide Hills or the McLaren Vale wine region. Alternatively, you may wish to take a stroll down Rundle Mall or visit the Adelaide Zoo and the Botanic Gardens. Later today, a chauffeured car will take you from your hotel to Adelaide Airport in time for your flight back to your homeport. Flights are included from all departure cities shown as required. These are based on Economy Class group airfares, and are subject to availability at the time of your booking confirmation. Please note that flights are weather dependent and delays may occur due to but not limited to unfavorable weather conditions.